Blue Apron reserves the right to change or modify these Terms at any time and in our sole discretion. If we make changes to these Terms, we will provide notice of such changes, such as by sending an email notification, providing notice through the Sites or updating the “Last Updated” date at the beginning of these Terms. By continuing to access or use the Sites or order, receive or use Products, you confirm your acceptance of the revised Terms and all of the terms incorporated therein by reference. We encourage you to review the Terms frequently to ensure that you understand the terms and conditions that apply when you access or use the Sites or order, receive or use the Products. If you do not agree to the revised Terms, you may not access or use the Sites or order, receive or use the Products. The Sites are not targeted toward or intended for use by anyone under the age of 18. By using the Sites, you represent and warrant that you (a) are 18 years of age or older, (b) are a legal resident of the United States, (c) have not been previously suspended or removed from the Sites, or engaged in any activity that could result in suspension or removal from the Sites, (d) have not created or do not have more than one Blue Apron account, unless expressly permitted by Blue Apron, and (e) have full power and authority to enter into these Terms and in so doing will not violate any other agreement to which you are a party. In addition, if you are the purchaser or recipient of any wine Products via the Sites, you further represent and warrant that (x) you are 21 years of age or older and are otherwise eligible to purchase or receive such wine Products, and (y) the person signing for and accepting delivery of any such wine Products is an adult 21 years of age or older, and presented a valid form of identification confirming such fact, at the time of delivery of such wine Products. We continually test new functionalities, services, options, initiatives, user interfaces, products and other features that we are considering developing, adding or incorporating into our Sites or Products (collectively, "Test Features"). We reserve the right, in our sole discretion, to include or exclude you, from these tests without notice and to discontinue or to modify any Test Feature at any time, for any or no reason, without prior notice and with no liability, to the fullest extent permitted by applicable law. To access and use certain areas or features of the Sites, you will need to register for a Blue Apron account. By creating an account, you agree to (a) provide accurate, current and complete account information, (b) maintain and promptly update, as necessary, your account information, (c) maintain the security of your account credentials, (d) be responsible for the acts or omissions of any third party who has authority to access or use the Sites on your behalf, and (e) immediately notify us if you discover or otherwise suspect any security breaches related to the Sites or your account. You further understand and agree that Blue Apron may take actions we deem reasonably necessary to prevent, respond to, pursue or remedy suspected or actual fraud and abuse, including without limitation, termination or suspension of your account. By creating a Blue Apron account, you also consent to receive electronic communications from Blue Apron (e.g., via email or by posting notices to the Sites). These communications may include notices about your account (e.g., payment authorizations, password changes and other transactional information) and are part of your relationship with us. You agree that any notices, agreements, disclosures or other communications that we send to you electronically will satisfy any legal communication requirements, including, but not limited to, that such communications be in writing. You should maintain copies of electronic communications from us by printing a paper copy or saving an electronic copy. We may also send you promotional communications via email, including, but not limited to, newsletters, special offers, surveys and other news and information we think will be of interest to you. You may opt out of receiving these promotional emails at any time by following the unsubscribe instructions provided therein. By providing your mobile phone number to us through the Sites or in connection with your order, receipt or use of our Product(s), you consent to receive calls or text messages at any such phone number sent by or on behalf of Blue Apron, including autodialed calls and/or text messages, for marketing, promotional, operational or transactional purposes, such as updates on the delivery status of your order of our Product. You may opt out of marketing and promotional calls or messages by following the applicable unsubscribe instructions provided to you. Following such opt-out, you may continue to receive calls or messages for a short period of time while Blue Apron processes your request. It is your responsibility to keep your account information, including your phone number, updated. Standard message and data rates applied by your mobile phone carrier may apply to the text messages we send you. Please contact your mobile phone carrier for details. Meal Subscriptions. We offer different subscription plans for our meal ingredients (each, a “Meal Subscription”). The number of meal servings (i.e., an individual portion of meal ingredients) you receive and the amount you are charged may vary from week to week depending on the dietary preferences and other selections you make. For example, we may provide you with greater flexibility to choose the number of meal servings you receive each week. If your Meal Subscription changes, the applicable weekly Meal Subscription price may also change. Changes to your Meal Subscription, or other choices you may make (such as the number of meal servings you receive), may also result in changes to any applicable shipping and handling charges and meal delivery times. If we change the prices or other charges associated with our various Meal Subscription plans, we will provide you with notice of such changes, such as by email or a notice posted on our Sites. The fees for the Meal Subscriptions can be found on your Plan Settings page and may be subject to change in the future. For more information about our Meal Subscriptions, please visit the Pricing page on our website and our FAQs. Note that we do not currently deliver Meal Subscriptions to every location, so please visit our Zip Code Finder to see if we deliver to your area. Continuous Subscriptions. WHEN YOU REGISTER FOR A MEAL SUBSCRIPTION, YOU EXPRESSLY ACKNOWLEDGE AND AGREE THAT (A) BLUE APRON (OR OUR THIRD-PARTY PAYMENT PROCESSOR) IS AUTHORIZED TO CHARGE YOU ON A WEEKLY BASIS FOR YOUR MEAL SUBSCRIPTION (IN ADDITION TO ANY APPLICABLE TAXES AND OTHER CHARGES) FOR AS LONG AS YOUR MEAL SUBSCRIPTION CONTINUES, (B) THE AMOUNT YOU ARE CHARGED AND THE NUMBER OF MEAL SERVINGS YOU RECEIVE EACH WEEK MAY VARY DEPENDING ON THE PREFERENCES YOU SELECT, AND (C) YOUR MEAL SUBSCRIPTION IS CONTINUOUS UNTIL YOU CANCEL IT OR WE SUSPEND OR STOP PROVIDING ACCESS TO THE SITES OR APPLICABLE PRODUCTS IN ACCORDANCE WITH THESE TERMS. YOU MAY SKIP YOUR WEEKLY MEAL ORDER AS OFTEN AS YOU'D LIKE BY MANAGING YOUR DELIVERY SCHEDULE LOCATED ON YOUR UPCOMING PAGE. FOR MORE INFORMATION ABOUT OUR PRICING AND BILLING POLICIES RELATED TO MEAL SUBSCRIPTIONS, PLEASE VISIT THE PRICING PAGE ON OUR WEBSITE AND OUR FAQS. Cancellation Policy. YOU MAY CANCEL YOUR MEAL SUBSCRIPTION ONLINE AT ANY TIME BY EMAILING CANCELLATIONS@BLUEAPRON.COM AND FOLLOWING THE INSTRUCTIONS IN OUR RESPONSE OR BY CONTACTING CUSTOMER SUPPORT. ANY MEAL ORDER(S) IDENTIFIED AS “PROCESSING” OR “SHIPPED” ON YOUR UPCOMING PAGE, HOWEVER, CANNOT BE CANCELLED. YOU WILL BE RESPONSIBLE FOR ALL CHARGES (INCLUDING ANY APPLICABLE TAXES AND OTHER CHARGES) INCURRED WITH RESPECT TO ANY MEAL ORDER IDENTIFIED AS "PROCESSING" OR "SHIPPED" PRIOR TO THE CANCELLATION OF YOUR MEAL SUBSCRIPTION. In the event you cancel your Meal Subscription, please note that we may still send you promotional communications about Blue Apron, unless you opt out of receiving those communications by following the unsubscribe instructions provided therein. Wine Subscriptions. In addition to our Meal Subscriptions, we offer a subscription plan for wine (a “Wine Subscription”). For more information about our Wine Subscription, please visit the Wine page on our website and our FAQs. Wine Products offered pursuant to our Wine Subscription are sold by us and fulfilled by our licensed fulfillment partners. We and our fulfillment partners maintain the applicable licenses and permits required for the sale and fulfillment of wine Products to you. As the rules restricting the sale and shipment of wine Products are complicated, we reserve the right to reject any wine Order for compliance reasons or otherwise. Note that we do not currently deliver wine to every location, so please visit our FAQs page to see if we deliver to your area. Continuous Subscriptions. WHEN YOU REGISTER FOR A WINE SUBSCRIPTION, YOU EXPRESSLY ACKNOWLEDGE AND AGREE THAT (A) BLUE APRON (OR OUR THIRD PARTY PAYMENT PROCESSOR) IS AUTHORIZED TO CHARGE YOU ON A MONTHLY BASIS FOR YOUR WINE SUBSCRIPTION (IN ADDITION TO ANY APPLICABLE TAXES AND OTHER CHARGES) FOR AS LONG AS YOUR WINE SUBSCRIPTION CONTINUES, AND (B) YOUR WINE SUBSCRIPTION IS CONTINUOUS UNTIL YOU CANCEL IT OR WE SUSPEND OR STOP PROVIDING ACCESS TO THE SITES OR APPLICABLE PRODUCTS IN ACCORDANCE WITH THESE TERMS. YOU MAY SKIP YOUR MONTHLY WINE ORDER AS OFTEN AS YOU'D LIKE BY MANAGING YOUR DELIVERY SCHEDULE LOCATED ON YOUR UPCOMING PAGE. FOR MORE INFORMATION ABOUT OUR PRICING AND BILLING POLICIES RELATED TO WINE SUBSCRIPTIONS, PLEASE VISIT THE WINE PAGE ON OUR WEBSITE AND OUR FAQS. Cancellation Policy. YOU MAY CANCEL YOUR WINE SUBSCRIPTION ONLINE AT ANY TIME BY EMAILING CANCELLATIONS@BLUEAPRONWINE.COM AND FOLLOWING THE INSTRUCTIONS IN OUR RESPONSE OR BY CONTACTING CUSTOMER SUPPORT. ANY WINE ORDER IDENTIFIED AS “PROCESSING” OR “SHIPPED” ON YOUR UPCOMING PAGE, HOWEVER, CANNOT BE CANCELLED. YOU WILL BE RESPONSIBLE FOR ALL CHARGES (INCLUDING ANY APPLICABLE TAXES AND OTHER CHARGES) INCURRED WITH RESPECT TO ANY WINE ORDER IDENTIFIED AS "PROCESSING" OR "SHIPPED" PRIOR TO THE CANCELLATION OF YOUR WINE SUBSCRIPTION. In the event you cancel your Wine Subscription, please note that we may still send you promotional communications about Blue Apron, unless you opt out of receiving those communications by following the unsubscribe instructions provided therein. Meal Purchases. From time to time we may make certain of our Products available on a non-subscription basis through our Sites (each, a "Meal Purchase"). For purposes of these Terms, Meal Purchases exclude meals and meal ingredients offered by Blue Apron Market, as described below. Third Party Purchases. From time to time, certain of our Products may be offered through a Third Party Channel (each, a "Third Party Purchase"). Your use of or interaction with any Third Party Channel are solely between you and the third party. Blue Apron does not control or endorse, and makes no representations or warranties regarding, any Third Party Channel. Third Party Channels may impose their own terms, policies or processes ("Third Party Terms"), separate from these Terms, and you should carefully review those Third Party Terms. Your access to and use of such Third Party Channels and your acceptance of Third Party Terms is at your own risk. Blue Apron Market. The Blue Apron Market is an online marketplace operated by Blue Apron Market, LLC, an affiliate of Blue Apron, LLC, where you can purchase various kitchen, cookware, bakeware, pantry and other Products from us. 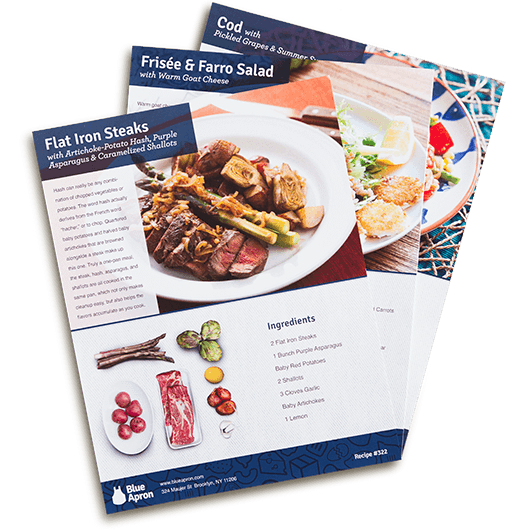 All Products purchased through Blue Apron Market are sold by Blue Apron Market, LLC. 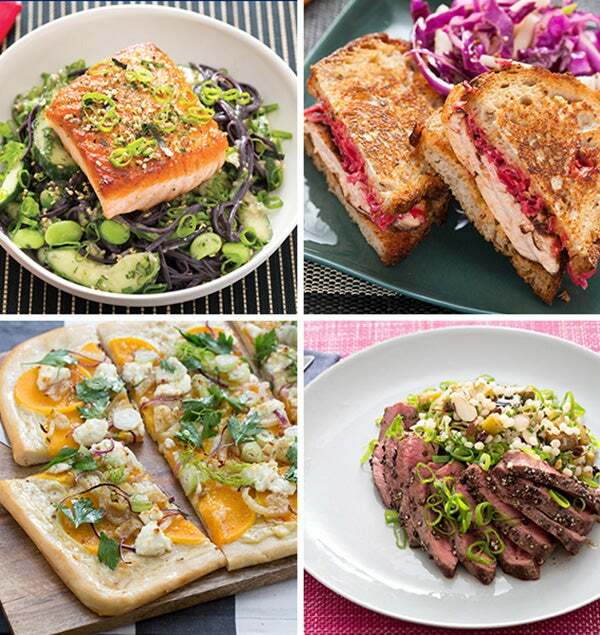 For more information, please visit the Blue Apron Market and our FAQs. For purposes of these Terms, any Products referenced in this Section 4.3 are referred to as "Non-Subscription Products." Blue Apron may offer gift cards from time to time. By purchasing or redeeming a Blue Apron gift card you agree to our Gift Card Terms and Conditions. By providing a credit card or other payment method that we accept, you represent and warrant that you are authorized to use the designated payment method and that you authorize us (or our third-party payment processor) to charge your payment method for the total amount of your subscription or other purchase (including any applicable taxes and other charges) (collectively, as applicable, an “Order”). If the payment method cannot be verified, is invalid or is otherwise not acceptable, your Order may be suspended or cancelled. You must resolve any payment method problems before we proceed with your Order. If you want to change or update your payment method information, you can do so at any time by logging into your account. If a payment is not successfully settled and you do not edit your payment method information or cancel your Meal Subscription, Wine Subscription, purchase of a Non-Subscription Product, or account, as applicable, you remain responsible for any uncollected amounts and, with respect to your Meal Subscription or Wine Subscription, authorize us to continue billing the payment method, as it may be updated. You acknowledge that the amount billed may vary due to promotional offers, preferences you select, changes you make to your Meal Subscription, Wine Subscription, purchase of a Non-Subscription Product, or changes in applicable taxes or other charges, and you authorize us (or our third party-payment processor) to charge your payment method for the corresponding amount. Notwithstanding anything provided above, for the purposes of this Section 4.6, any Third Party Purchase will be billed and charged in accordance with the applicable Third Party Terms. All prices on our Sites are shown in U.S. dollars and applicable taxes and other charges, if any, are additional. We reserve the right to adjust prices as we may determine in our sole discretion, at any time and without notice, including without limitation, as based on geographic or other criteria as we may establish from time to time; provided, however, that if we change the amounts or other charges associated with our various subscription plans, we will provide advance notice of such changes in accordance with Section 3. We will not, however, be able to notify you of changes in any applicable taxes. The shipment of meal ingredients or wine, as applicable, to you after our delivery of such notice will confirm your acceptance of such changes, unless you cancel your subscription(s) in accordance with the cancellation policies set forth in Sections 4.1 and 4.2, as applicable. All of our Products are subject to availability, and we reserve the right to impose quantity limits on any Order, to reject all or part of an Order, to discontinue offering certain Products and to substitute Products (including, but not limited to, specific meal ingredients or entire meals) without prior notice. We strive to provide you with high-quality Products, and given the perishable nature of certain Products and market conditions beyond our control, we may be required to make substitutions from time to time. If you are not satisfied with a substitution, please contact us at contact@blueapron.com or contact@blueapronwine.com, as applicable. If you are a resident of the State of Illinois, in lieu of having your wine Product delivered to you, you may pick up your wine Product from us in California. Please contact us at contact@blueapronwine.com by your “Changeable Before” date reflected in your Plan Settings to make such arrangements. We will collect applicable sales, use and other tax (collectively, "Tax") on Products shipped to jurisdictions for which we determine we have a duty to collect Tax applicable to your purchase. If an item is subject to Tax, you agree that the amount of Tax shown at checkout may be adjusted. Several factors may cause this, such as variances between processor programs and changes in applicable Tax rates. We will collect the simplified sellers use tax on Products delivered into Alabama and the tax will be remitted on your behalf to the Alabama Department of Revenue. Our program account number with the Alabama Department of Revenue is SSU-R010237573. You agree to pay any shipping and handling charges shown at the time you make a purchase. We reserve the right to increase, decrease, add or eliminate shipping and handling charges from time to time, but we will provide notice of the charges applicable to you before you make your purchase. Generally, shipping is handled by a third party courier. When you purchase a Product from our Sites, any shipping times shown are estimates only. Actual delivery dates may vary. You agree that you will not obtain, or direct shipment of, a Product for export. Notwithstanding anything provided above, for the purposes of this Section 4.9, shipping and handling for any Third Party Purchase will be made in accordance with and subject to the applicable Third Party Terms. You are responsible for inspecting all Products for any damage or other issues upon delivery. In addition, you are solely responsible for determining the freshness of the Products you receive. We recommend that you use a thermometer to ensure that the internal temperature of any meat, poultry or seafood Product is 40° F or below. In the unlikely event that such temperature is above 40° F, or you have any other reason to believe that any other Product in your delivery or purchase is not suitable for consumption, contact us at contact@blueapron.com, or the applicable Third Party Channel, and discard the item. To maintain the quality and integrity of the Products, we recommend that you immediately refrigerate all perishable Products upon delivery or purchase and follow the U.S. Department of Agriculture’s (“USDA”) instructions on refrigeration and food safety, which can be found here. We recommend that you follow the USDA’s instructions on safe food handling, which can be found here. We also recommend that you use a food thermometer to ensure that all meat, poultry, seafood and other applicable items are cooked to the USDA’s recommended internal temperatures, which can be found here. Failure to follow safe food handling practices and temperature recommendations may increase the risk of foodborne illness. In addition, pregnant women, young children, the elderly and individuals with compromised immune systems should follow the U.S. Food and Drug Administration’s recommendations on food consumption for at-risk groups, which can be found here. If you are not at home when your meal delivery arrives, the courier will generally leave the package for you at your door, unless other delivery instructions have been communicated to you. Our meal ingredients may be packaged with insulated liners and gel packs and will typically remain cold and fresh for several hours, but depending on the season and temperature in your geographic area at the time of delivery, advance planning by you should be made for immediate and proper storage of your meal ingredients prior to consumption. In certain areas, you may be able to provide additional delivery instructions when setting up your Blue Apron account, such as requesting that your delivery be left with a doorman or neighbor. Any individual at the delivery address who accepts a delivery from us is presumed to be authorized to receive such delivery. In cases in which you have designated an alternative receiver, such person shall accept the delivery under all of the same terms and conditions that would apply had you accepted the delivery yourself. Notwithstanding anything provided above, packaging of and delivery instructions related to any Third Party Purchase may vary depending on the applicable Third Party Channel; accordingly, for the purposes of this Section 4.10, any deliveries of Third Party Purchases may be subject to additional applicable Third Party Terms. An adult who is 21 years of age or older must be present and have a valid form of identification to sign and accept for delivery of wine Products. In the case of inclement weather or other events beyond our control that interfere with our ability to deliver your Order, we will attempt to deliver your Order as soon as reasonably possible. In some cases, delivery may occur prior to the scheduled delivery date. If timely delivery of your meal ingredients is not feasible, we may cancel your meal delivery for the period so affected and issue you a Credit (as defined below) or refund of the purchase price for that meal delivery. If you are dissatisfied with a meal or meal ingredient ordered on our Sites for any reason, please contact us at contact@blueapron.com within seven (7) days of the date you received the meal. Depending on the circumstances, we may, in our sole discretion, replace the meal or meal ingredient at our expense, provide you a full or partial refund of the purchase price for that meal or meal ingredient, or provide you with Credits for that meal or meal ingredient that will automatically be applied to future deliveries under your Meal Subscription or Meal Purchases, as applicable. Notwithstanding the foregoing, Credits for certain types of Meal Purchases may require additional action on your part (e.g., application of a coupon code) in order to be applied to future purchases, which shall be communicated to you at the time of issuance. If any wine Product you receive arrives damaged, please contact us at contact@blueapronwine.com within seven (7) days of the date you received the wine Product. Depending on the circumstances, we may, in our sole discretion, replace the wine Product at our expense, provide you with a full or partial refund of the purchase price of the damaged wine Product, or provide you with Credits for the damaged wine Product that will automatically be applied to future deliveries under your Wine Subscription. We may require the return or photographic documentation of any Product that you are dissatisfied with before we provide you a refund, replacement, or Credit. If you are dissatisfied with any non-consumable Product you purchased from Blue Apron Market, LLC, you may return such Product within thirty (30) days of the date you received such Product by contacting market@blueapron.com and following the shipping instructions we provide; provided, that all such returned Products must be unused and in their original packaging. After we receive such returned Product, we will issue you a refund for the price you paid for such Product (less any applicable shipping and handling charges). Blue Apron Market, LLC does not take title to returned Product purchased through the Blue Apron Market until such Product arrives back at Blue Apron Market's or its third party designee’s fulfillment center, as applicable. In certain circumstances, such as if we want to thank you for your patience with a delayed delivery or to address another customer service issue, we may provide you customer experience credits of promotional value that will be automatically applied to your next eligible Order under your Meal Subscription, Wine Subscription, or with respect to a Meal Purchase, as applicable (“Credits”). Credits may only be redeemed for the type of Product for which they were issued (i.e., Credits for a meal or meal ingredient may only be applied to future deliveries under your Meal Subscription or a Meal Purchase, as applicable, and Credits for a wine Product may only be applied to future deliveries under your Wine Subscription). In addition to the foregoing, Credits for certain types of Meal Purchases may only be applied to future deliveries of the specific type of Meal Purchase for which they were issued. Credits are promotional in nature, are not transferable, and are not redeemable for cash or other property. Credits only remain available if you maintain a valid Blue Apron account and, with respect to Credits for a Wine Product, an active Wine Subscription. That means that if you cancel your Blue Apron account or, with respect to Credits for a wine Product, your Wine Subscription, any outstanding Credits associated with your cancelled Blue Apron account or Wine Subscription, as applicable, will immediately expire. You may only redeem Credits after they are applied to your Blue Apron account. If for some reason you believe that there is a discrepancy regarding your Credit balance, please contact us at contact@blueapron.com for Meal Subscription or Meal Purchase-related Credit inquiries or contact@blueapronwine.com for Wine Subscription-related Credit inquiries. All decisions regarding your Credit balance will be determined in our sole discretion and are final. Notwithstanding anything provided above, for the purposes of this Section 4.12, returns of and refunds for any Third Party Purchases will be subject to the applicable Third Party Terms. If you are dissatisfied with any Third Party Purchases, please contact the applicable Third Party Channel for their return and refund policies. Unless otherwise indicated in writing by us, the Sites and all content and other materials contained therein, including, without limitation, the Blue Apron logo and all designs, text, graphics, pictures, information, data, software, sound files, User Content (as defined in Section 11), other files and the selection and arrangement thereof (collectively, “Content”) are the proprietary property of Blue Apron or our licensors or users, as applicable, and are protected by U.S. and international copyright laws. You are hereby granted a limited, nonexclusive, nontransferable, nonsublicensable license to access and use the Sites and Content. However, such license is subject to these Terms and does not include any right to (a) sell, resell or use commercially the Sites or Content, (b) distribute, publicly perform or publicly display any Content, (c) modify or otherwise make any derivative uses of the Sites or Content, or any portion thereof, (d) use any data mining, robots or similar data gathering or extraction methods, (e) download (other than the page caching) any portion of the Sites or Content, except as expressly permitted by us, and (f) use the Sites or Content other than for their intended purposes. Any use of the Sites or Content other than as specifically authorized herein, without our prior written permission, is strictly prohibited and will terminate the license granted herein. Such unauthorized use may also violate applicable laws, including, without limitation, copyright and trademark laws and applicable communications regulations and statutes. Unless explicitly stated by us, nothing in these Terms shall be construed as conferring any right or license to any patent, trademark, copyright or other proprietary rights of Blue Apron or any third party, whether by estoppel, implication or otherwise. This license is revocable at any time. Notwithstanding anything to the contrary in these Terms, the Sites and Content may include software components provided by Blue Apron or a third party that are subject to separate license terms, in which case those license terms will govern such software components. “Blue Apron,” the Blue Apron logo and any other Blue Apron Product or service names, logos or slogans that may appear on the Sites or Products are trademarks of Blue Apron and may not be copied, imitated or used, in whole or in part, without our prior written permission. You may not use any metatags or other “hidden text” utilizing “Blue Apron” or any other name, trademark or Product or service name of Blue Apron without our prior written permission. In addition, the look and feel of the Sites and Products, including, without limitation, all page headers, custom graphics, button icons and scripts, constitute the service mark, trademark or trade dress of Blue Apron and may not be copied, imitated or used, in whole or in part, without our prior written permission. All other trademarks, registered trademarks, Product names and company names or logos mentioned on the Sites or Products are the property of their respective owners and may not be copied, imitated or used, in whole or in part, without the permission of the applicable trademark holder. Reference to any Products, services, processes or other information by name, trademark, manufacturer, supplier or otherwise does not constitute or imply endorsement, sponsorship or recommendation by Blue Apron. You are granted a limited, nonexclusive, nontransferable right to create a text hyperlink to the Sites for noncommercial purposes, provided that such link does not portray Blue Apron or any of our Products in a false, misleading, derogatory or otherwise defamatory manner, and provided further that the linking site does not contain any adult or illegal material or any material that is offensive, harassing or otherwise objectionable. This limited right may be revoked at any time. You may not use a Blue Apron logo or other proprietary graphic of Blue Apron to link to the Sites without our express written permission. Further, you may not use, frame or utilize framing techniques to enclose any Blue Apron trademark, logo or other proprietary information, including the images found on the Sites or Products, the content of any text or the layout or design of any page, or form contained on a page, on the Sites without our express written consent. Blue Apron makes no claim or representation regarding the quality, content, nature or reliability of third party websites accessible by hyperlink from the Sites or of websites linking to the Sites. Such sites are not under our control and we provide these links to you only as a convenience. The inclusion of any link does not imply our affiliation, endorsement or adoption of any site or any information contained therein. Except as otherwise provided herein, when you leave the Sites, you should be aware that our terms and policies no longer govern. You should review the applicable terms and policies, including privacy and data gathering practices, of any site to which you navigate from the Sites. User Content that, in our sole judgment, is objectionable or that restricts or inhibits any other person from using or enjoying the Sites or Products, or that may expose Blue Apron or others to any harm or liability of any type. If you submit content you own, you retain your ownership of your intellectual property rights. We do not claim any ownership interest in your User Content. However, by uploading, posting or submitting User Content to the Sites or to our pages or feeds on third party social media platforms (e.g., Blue Apron’s Facebook page, Instagram page or Twitter feed), you hereby grant Blue Apron a nonexclusive, royalty-free, worldwide, perpetual, irrevocable and fully sublicensable right and license to use, reproduce, modify, adapt, publish, translate, create derivative works from, distribute, perform and publicly display your User Content, in whole or in part, and your name, likeness, voice and persona in any manner or media and for any purpose whatsoever at our sole discretion, including, without limitation, for publicity, promotional, advertising, trade, business, illustration, artistic and other commercial and noncommercial purposes. By uploading, posting or submitting User Content to Blue Apron through the Sites or through our pages or feeds on third party social media platforms, you represent and warrant that (a) such User Content is nonconfidential, (b) you own and control all of the rights to the User Content or you otherwise have all necessary rights to post such User Content, (c) you authorize Blue Apron to use such User Content for the purposes described in these Terms, (d) the User Content is accurate and not misleading or harmful in any manner, and (e) the User Content, and your use and posting thereof, does not and will not violate these Terms or any applicable law, rule, regulation or third party right. Separate and apart from User Content, you can submit questions, comments, suggestions, ideas, original or creative materials or other information about Blue Apron, the Sites or the Products (collectively, “Feedback”). Feedback is nonconfidential and shall become the sole property of Blue Apron. Blue Apron shall own exclusive rights, including, without limitation, all intellectual property rights, in and to such Feedback and shall be entitled to the unrestricted use and dissemination of this Feedback for any purpose, commercial or otherwise, without acknowledgment or compensation to you. To the fullest extent permitted by applicable law, you agree to indemnify, defend and hold harmless Blue Apron, and our respective past, present and future employees, officers, directors, contractors, consultants, equityholders, suppliers, vendors, service providers, parent companies, subsidiaries, affiliates, agents, representatives, predecessors, successors and assigns (individually and collectively, the “Blue Apron Parties”), from and against all actual or alleged Blue Apron Party or third party claims, damages, awards, judgments, losses, liabilities, obligations, penalties, interest, fees, expenses and costs of every kind and nature whatsoever, whether known or unknown, foreseen or unforeseen, matured or unmatured, or suspected or unsuspected, in law or equity, whether in tort, contract or otherwise (collectively, “Claims”), including, but not limited to, damages to property or personal injury, that are caused by, arise out of or are related to (a) any use or misuse of the Sites, Content or Products by you or any third party you authorize to access or use such Sites, Content or Products, (b) any User Content you create, post, share or store on or through the Sites or our pages or feeds on third party social media platforms, (c) any Feedback you provide, (d) your violation of these Terms, and (e) your violation of the rights of another. You agree to promptly notify Blue Apron of any third party Claims, cooperate with the Blue Apron Parties in defending such Claims and pay all fees, costs and expenses associated with defending such Claims (including, but not limited to, attorneys’ fees and expenses, court costs, costs of settlement and costs of pursuing indemnification and insurance). You further agree that the Blue Apron Parties shall have control of the defense or settlement of any third party Claims. This indemnity is in addition to, and not in lieu of, any other indemnities set forth in a written agreement between you and Blue Apron. YOU ARE SOLELY RESPONSIBLE FOR, AND ASSUME ALL RISKS RELATED TO, THE PROPER AND SAFE WASHING, HANDLING, PREPARATION, STORAGE, COOKING, USE AND CONSUMPTION OF THE PRODUCTS. YOU ARE ALSO SOLELY RESPONSIBLE FOR KNOWING ABOUT ANY FOOD ALLERGIES YOU MAY HAVE AND VERIFYING THE PRODUCTS AND THEIR CONTENTS BEFORE HANDLING, PREPARING, USING OR CONSUMING SUCH PRODUCTS. FURTHER, YOU UNDERSTAND, ACKNOWLEDGE AND AGREE THAT WE STORE, PORTION AND PACKAGE PRODUCTS CONTAINING ALL EIGHT (8) MAJOR U.S. ALLERGENS (MILK, WHEAT, EGG, SOY, FISH, SHELLFISH, PEANUTS AND TREENUTS) AND CANNOT GUARANTEE THAT CROSS-CONTAMINATION WILL NOT OCCUR BETWEEN PRODUCTS. WE ATTEMPT TO DISPLAY THE PRODUCTS AND OTHER MATERIALS AND INFORMATION YOU VIEW ON THE SITES, INCLUDING PRICING AND NUTRITIONAL INFORMATION, AS ACCURATELY AS POSSIBLE. HOWEVER, WE DO NOT GUARANTEE THE ACCURACY OF SUCH MATERIALS AND INFORMATION. IN THE EVENT OF AN ERROR ON OUR SITES, IN AN ORDER CONFIRMATION, IN PROCESSING OR DELIVERING AN ORDER OR OTHERWISE, WE RESERVE THE RIGHT TO CORRECT SUCH ERROR AND REVISE YOUR ORDER ACCORDINGLY (INCLUDING CHARGING THE CORRECT PRICE) OR TO CANCEL YOUR ORDER AND ISSUE YOU A REFUND. YOU FURTHER AGREE THAT THE PRODUCTS AND OTHER MATERIALS YOU RECEIVE IN YOUR ORDER MAY VARY FROM THE PRODUCTS AND MATERIALS DISPLAYED ON THE SITES DUE TO A NUMBER OF FACTORS, INCLUDING, WITHOUT LIMITATION, SYSTEM CAPABILITIES AND CONSTRAINTS OF YOUR COMPUTER, MANUFACTURING PROCESS OR SUPPLY ISSUES, THE AVAILABILITY AND VARIABILITY OF PRODUCTS, DISTINCT COOKING OR OTHER PREPARATION METHODS AND VARIABILITY OF COOKING EQUIPMENT AND APPLIANCES. THE SITES MAY CONTAIN INFORMATION ABOUT PRODUCTS THAT ARE NOT AVAILABLE IN EVERY LOCATION. A REFERENCE TO A PRODUCT ON THE SITES DOES NOT IMPLY OR GUARANTEE THAT IT IS OR WILL BE AVAILABLE IN YOUR LOCATION OR AT THE TIME OF YOUR ORDER. WITHOUT LIMITING THE GENERALITY OF THE FOREGOING, WE MAKE NO REPRESENTATIONS OR WARRANTIES OF ANY KIND REGARDING ANY CONTENT RELATED TO OUR PRODUCTS PROVIDED BY OR DISPLAYED THROUGH A THIRD PARTY CHANNEL, INCLUDING, WITHOUT LIMITATION, REGARDING ITS ACCURACY OR COMPLETENESS. EXCEPT AS MAY BE PROVIDED IN A WARRANTY BY THE MANUFACTURER OF A PRODUCT, ALL PRODUCTS AND THE SITES AND CONTENT ARE PROVIDED ON AN “AS IS” BASIS WITHOUT WARRANTIES OF ANY KIND, EITHER EXPRESS OR IMPLIED. BLUE APRON DISCLAIMS ALL OTHER WARRANTIES, EXPRESS OR IMPLIED, INCLUDING, WITHOUT LIMITATION, IMPLIED WARRANTIES OF MERCHANTABILITY, FITNESS FOR A PARTICULAR PURPOSE, TITLE AND NON-INFRINGEMENT AS TO THE SITES, CONTENT AND PRODUCTS, ANY WARRANTIES THAT ARISE FROM TRADE USAGE OR CUSTOM, AND ANY WARRANTIES THAT THE SITES OR PRODUCTS WILL BE FREE AND CLEAR FROM ANY ADVERSE LIEN OR SECURITY INTERESTS. TO THE FULLEST EXTENT PERMITTED BY APPLICABLE LAW, IN NO EVENT SHALL THE BLUE APRON PARTIES BE LIABLE FOR ANY INDIRECT, SPECIAL, INCIDENTAL, OR CONSEQUENTIAL DAMAGES OF ANY KIND (INCLUDING, BUT NOT LIMITED TO, LOSS OF REVENUE, INCOME OR PROFITS, LOSS OF USE OR DATA, LOSS OR DIMINUTION IN VALUE OF ASSETS OR SECURITIES, OR DAMAGES FOR BUSINESS INTERRUPTION) ARISING OUT OF OR IN ANY WAY RELATED TO THE ACCESS TO OR USE OF THE SITES OR CONTENT (INCLUDING, BUT NOT LIMITED TO, USER CONTENT, THIRD PARTY CONTENT AND LINKS TO THIRD PARTY SITES), OR THE ORDER, RECEIPT OR USE OF ANY PRODUCT, OR OTHERWISE RELATED TO THESE TERMS (INCLUDING, BUT NOT LIMITED TO, ANY DAMAGES CAUSED BY OR RESULTING FROM RELIANCE ON ANY INFORMATION OBTAINED FROM ANY BLUE APRON PARTY, OR FROM EVENTS BEYOND THE BLUE APRON PARTIES’ REASONABLE CONTROL, SUCH AS SITE INTERRUPTIONS, DELETIONS OF FILES OR EMAILS, ERRORS OR OMISSIONS, DEFECTS, BUGS, VIRUSES, TROJAN HORSES, DELAYS IN OPERATION OR TRANSMISSION OR ANY FAILURE OF PERFORMANCE, WHETHER OR NOT RESULTING FROM ACTS OF GOD, COMMUNICATIONS FAILURE, THEFT, DESTRUCTION OR UNAUTHORIZED ACCESS TO THE BLUE APRON PARTIES’ RECORDS, PROGRAMS OR SYSTEMS), REGARDLESS OF THE FORM OF ACTION, WHETHER BASED IN CONTRACT, TORT (INCLUDING, BUT NOT LIMITED TO, SIMPLE NEGLIGENCE, WHETHER ACTIVE, PASSIVE OR IMPUTED) OR ANY OTHER LEGAL OR EQUITABLE THEORY (EVEN IF THE PARTY HAS BEEN ADVISED OF THE POSSIBILITY OF SUCH DAMAGES AND REGARDLESS OF WHETHER SUCH DAMAGES WERE FORESEEABLE). TO THE FULLEST EXTENT PERMITTED BY APPLICABLE LAW, IN NO EVENT SHALL THE MAXIMUM AGGREGATE LIABILITY OF THE BLUE APRON PARTIES (JOINTLY) ARISING OUT OF OR IN ANY WAY RELATED TO (A) THE ORDER, RECEIPT OR USE OF PRODUCTS PURCHASED FROM BLUE APRON MARKET, LLC EXCEED THE AMOUNT PAID FOR SUCH PRODUCTS; AND (B) THE ORDER, RECEIPT OR USE OF MEAL INGREDIENTS, OR ACCESS OR USE OF THE SITES OR CONTENT, EXCEED THE GREATER OF $250 OR THE AMOUNT YOU PAID TO US IN THE ONE (1) MONTH PERIOD IMMEDIATELY PRECEDING THE DATE ON WHICH YOUR CLAIM AROSE. THE FOREGOING LIMITATIONS SHALL APPLY EVEN IN THE EVENT YOUR REMEDIES HEREUNDER FAIL OF THEIR ESSENTIAL PURPOSE, AND THE FOREGOING SHALL CONSTITUTE THE BLUE APRON PARTIES’ SOLE LIABILITY AND OBLIGATION IN RESPECT HEREOF, REGARDLESS OF THE FORM OF ACTION, WHETHER BASED IN CONTRACT, TORT (INCLUDING, BUT NOT LIMITED TO, SIMPLE NEGLIGENCE, WHETHER ACTIVE, PASSIVE OR IMPUTED), OR ANY OTHER LEGAL OR EQUITABLE THEORY. PLEASE READ THE FOLLOWING SECTION CAREFULLY BECAUSE IT REQUIRES YOU TO ARBITRATE CERTAIN DISPUTES AND CLAIMS WITH BLUE APRON AND LIMITS THE MANNER IN WHICH YOU CAN SEEK RELIEF FROM US. Except for any disputes, claims, suits, actions, causes of action, demands or proceedings (collectively, “Disputes”) arising out of or related to a violation of Section 10 or Disputes in which either party seeks to bring an individual action in small claims court or seeks injunctive or other equitable relief for the alleged unlawful use of intellectual property, including, without limitation, copyrights, trademarks, trade names, logos, trade secrets or patents, you and Blue Apron agree (a) to waive your and Blue Apron’s respective rights to have any and all Disputes arising from or related to these Terms, or the Sites, Content or Products (including, without limitation, Third Party Purchases), resolved in a court, and (b) to waive your and Blue Apron’s respective rights to a jury trial. Instead, you and Blue Apron agree to arbitrate Disputes through binding arbitration (which is the referral of a Dispute to one or more persons charged with reviewing the Dispute and making a final and binding determination to resolve it instead of having the Dispute decided by a judge or jury in court). You and Blue Apron agree that any Dispute arising out of or related to these Terms or the Sites, Content or Products is personal to you and Blue Apron and that such Dispute will be resolved solely through individual arbitration and will not be brought as a class arbitration, class action or any other type of representative proceeding. You and Blue Apron agree that there will be no class arbitration or arbitration in which an individual attempts to resolve a Dispute as a representative of another individual or group of individuals. Further, you and Blue Apron agree that a Dispute cannot be brought as a class or other type of representative action, whether within or outside of arbitration, or on behalf of any other individual or group of individuals. You and Blue Apron agree that these Terms affect interstate commerce and that the enforceability of this Section 18 shall be both substantively and procedurally governed by and construed and enforced in accordance with the Federal Arbitration Act, 9 U.S.C. § 1 et seq. (the “FAA”), to the maximum extent permitted by applicable law. You and Blue Apron agree that each party will notify the other party in writing of any arbitrable or small claims Dispute within thirty (30) days of the date it arises, so that the parties can attempt in good faith to resolve the Dispute informally. Notice to Blue Apron shall be sent by certified mail or courier to Blue Apron, LLC, Attn: General Counsel, 40 West 23rd Street, Floor 5, New York, NY 10010. Your notice must include (a) your name, postal address, telephone number, the email address you use or used for your Blue Apron account and, if different, an email address at which you can be contacted, (b) a description in reasonable detail of the nature or basis of the Dispute, and (c) the specific relief that you are seeking. Our notice to you will be sent electronically in accordance with Section 3 and will include (x) our name, postal address, telephone number and an email address at which we can be contacted with respect to the Dispute, (y) a description in reasonable detail of the nature or basis of the Dispute, and (z) the specific relief that we are seeking. If you and Blue Apron cannot agree how to resolve the Dispute within thirty (30) days after the date notice is received by the applicable party, then either you or Blue Apron may, as appropriate and in accordance with this Section 18, commence an arbitration proceeding or, to the extent specifically provided for in Section 18.1, file a claim in court. EXCEPT FOR DISPUTES ARISING OUT OF OR RELATED TO A VIOLATION OF SECTION 10 OR DISPUTES IN WHICH EITHER PARTY SEEKS TO BRING AN INDIVIDUAL ACTION IN SMALL CLAIMS COURT OR SEEKS INJUNCTIVE OR OTHER EQUITABLE RELIEF FOR THE ALLEGED UNLAWFUL USE OF INTELLECTUAL PROPERTY, INCLUDING, WITHOUT LIMITATION, COPYRIGHTS, TRADEMARKS, TRADE NAMES, LOGOS, TRADE SECRETS OR PATENTS, YOU AND BLUE APRON AGREE THAT ANY DISPUTE MUST BE COMMENCED OR FILED BY YOU OR BLUE APRON WITHIN ONE (1) YEAR OF THE DATE THE DISPUTE AROSE, OTHERWISE THE UNDERLYING CLAIM IS PERMANENTLY BARRED (WHICH MEANS THAT YOU AND BLUE APRON WILL NO LONGER HAVE THE RIGHT TO ASSERT SUCH CLAIM REGARDING THE DISPUTE). You and Blue Apron agree that (a) any arbitration will occur in the State of New York, County of New York, Borough of Manhattan, (b) arbitration will be conducted confidentially by a single arbitrator in accordance with the rules of the Judicial Arbitration and Mediation Services (“JAMS”), which are hereby incorporated by reference, and (c) that the state or federal courts of the State of New York and the United States, respectively, sitting in the State of New York, County of New York, Borough of Manhattan, have exclusive jurisdiction over any appeals and the enforcement of an arbitration award. You may also litigate a Dispute in the small claims court located in the county of your billing address if the Dispute meets the requirements to be heard in small claims court. If any term, clause or provision of this Section 18 is held invalid or unenforceable, it will be so held to the minimum extent required by law, and all other terms, clauses and provisions of this Section 18 will remain valid and enforceable. Further, the waivers set forth in Section 18.2 are severable from the other provisions of these Terms and will remain valid and enforceable, except as prohibited by applicable law. You have the right to opt out of binding arbitration within thirty (30) days of the date you first accepted the terms of this Section 18 by writing to: Blue Apron, LLC, Attn: General Counsel, 40 West 23rd Street, Floor 5, New York, NY 10010. In order to be effective, the opt out notice must include your full name and clearly indicate your intent to opt out of binding arbitration. By opting out of binding arbitration, you are agreeing to resolve Disputes in accordance with Section 19. These Terms, your access to and use of the Sites and your order, receipt and use of the Products shall be governed by and construed and enforced in accordance with the laws of the State of New York, without regard to conflict of law rules or principles (whether of the State of New York or any other jurisdiction) that would cause the application of the laws of any other jurisdiction. Any Dispute between the parties that is not subject to arbitration or cannot be heard in small claims court, shall be resolved in the state or federal courts of the State of New York and the United States, respectively, sitting in the State of New York, County of New York, Borough of Manhattan. The following sections will survive the expiration or termination of these Terms and the termination of your Blue Apron account: all defined terms and Sections 1, 3, 4, 5 (first paragraph only), 6, 7, 8 (second paragraph only), 9 through 23. These Terms constitute the entire agreement between you and Blue Apron relating to your access to and use of the Sites and your order, receipt and use of Products. These Terms, and any rights and licenses granted hereunder, may not be transferred or assigned by you without the prior written consent of Blue Apron. No waiver of any provision of these Terms will constitute a waiver of such provision in any prior, concurrent or subsequent circumstance, and Blue Apron’s failure to assert any right or provision under these Terms shall not constitute a waiver of such right or provision. Except as otherwise provided herein, these Terms are intended solely for the benefit of the parties and are not intended to confer third party beneficiary rights upon any other person or entity.